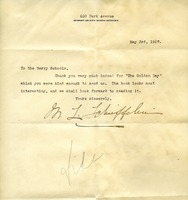 Letter of Thanks for "The Golden Day"
This is a letter of gratitude from Mr. L Schieffelieu (sp?) for the book, "The Golden Day", which was sent to him. He states that the book "looks most interesting, and we shall look forward to reading it"